Above the mob in Jerusalem, the Animus appears as a massive, lumbering figure. Holding the Dead Sea Scroll he stole, the Animus informs the people that for centuries he has watched humanity wage religious wars with one another and that their beliefs have caused nothing but death and suffering to humanity. Having interpreted the scroll his own way, he’s come to the conclusion that the only way to help humanity is to wipe it out. Golani, the spiritual guardian of Jerusalem, disagrees and blasts the creature of darkness with concentrated light. Animus sicks Katmandu and Al-Falqa on her and they drag her to the ground. April and Oyuki finally arrive on the scene, hoping to get some footage of the Animus. April shines a spotlight on him, which causes the monster great pain. Golani uses the distraction to break free and blast the villain with more concentrated light. Animus vanishes, vowing to return after dark when he’s more powerful. The mob, now free of the Animus’s control, regain their senses. 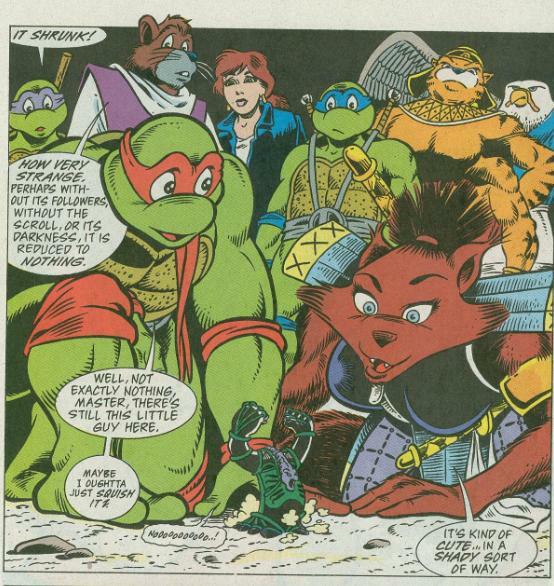 As the Turtles regroup, Splinter has terrible news: the Molotov cocktail explosion has left Michaelangelo blind. Back in the hotel room, Golani returns to her human form as Ariella and tells her comrades about the Animus. He is a creature of darkness who is worshipped by a cult known as the Hashasheem. They’re situated in a place called Nimrod’s Fortress, so she suggests they start looking for answers there. Sadly, Michaelangelo has to stay behind due to his condition. Splinter orders Oyuki to remain with him and keep him safe. At Nimrod’s Fortress, the Turtles meet up with Katmandu and Al-Falqa, who are looking to get even for being hypnotized by Animus. Together, they all sneak underneath the fortress, through the catacombs. They are quickly found out by the Hashasheem and a brawl ensues. Golani subdues the last of the cultists with a blast of light. The humans defeated, the gang journeys into the ceremonial chamber where they find a giant statue of the Animus, and beneath it, the Dead Sea Scrolls. The statue turns out to be the real thing, but Golani is not concerned. Without his cultists to give him power through their belief, the Animus is too weak to harm anybody. The Animus then proceeds to shrink down to the size of an action figure. Not wanting to just let him run free, Ninjara comes up with a solution. Back at the hotel, they place the (furious) Animus inside Oyuki’s snow globe souvenir that she bought at the airport. The Mutanimals step out to the beach to investigate the strange meteorite. Considering it didn’t destroy all of Mutani-Isle when it struck, Jagwar deduces that it isn’t a real meteorite. He is correct, as it is actually a spaceship containing Scul and Bean! 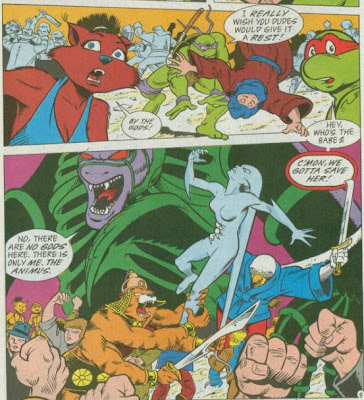 Mondo Gecko tells Candy to take cover while he and the Mutanimals deal with Queen Maligna’s old goons. The fight goes well, as Wingnut eventually wins by using his shrunken wings to fly, lifting Bean up and dropping him on top of Scul. Thinking the battle over, the Mutanimals let their guard down, leaving them wide open to a surprise attack from the Gang of Four. Dead-Eye, Executor and Lynch mow the Mutanimals down with a stream of machinegun fire while Fist finishes the job with a blast from his rocket launcher. Their job complete, the Gang of Four tells Scul and Bean to quit playing possum so they can go. As they take off in the meteor-ship, Scul and Bean titter over what is to come. Appearing through a time-slip, future-Don and future-Raph discover they’ve arrived too late (funny, I thought they had a time machine…?). Future-Raph mumbles that things weren’t supposed to turn out this way as Don scans the bodies of the Mutanimals. They’re all dead. Suddenly, Slash emerges from the waves, enraged. 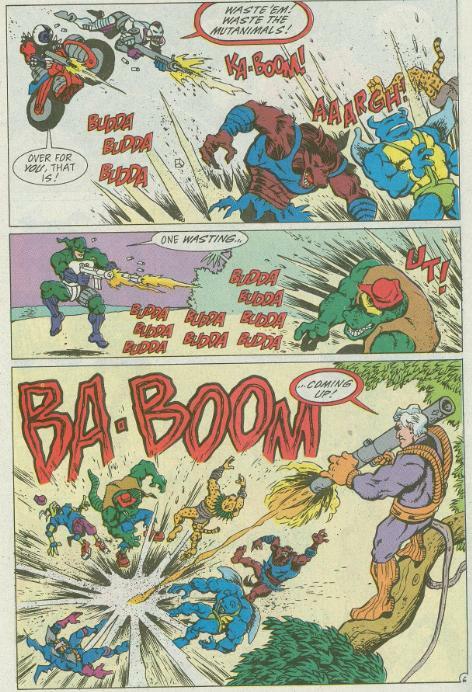 Blaming the future-Turtles for the deaths of his friends, he swears to kill them. 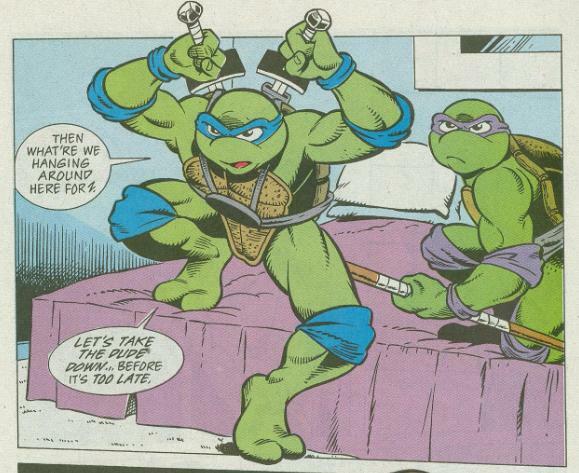 *This story is continued from TMNT Adventures #53. The story continues in TMNT Adventures #55. *Scul and Bean last appeared in Mighty Mutanimals (miniseries) #3. 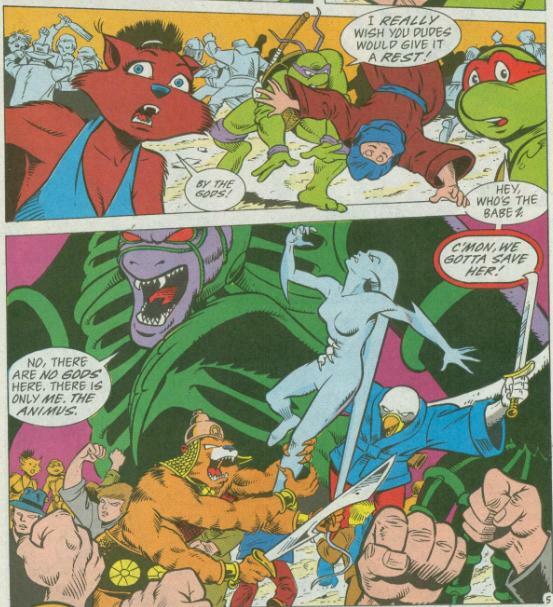 *Golani was originally planned to return in TMNT Adventures #72 and both Katmandu and Al'Falqa were to return in TMNT Adventures #73. However, "The Forever War" storyline was abruptly cancelled and thus they never appeared in the book again. A pretty sloppy conclusion to the story, if I must say. The way they beat Animus is so slapdash and rushed; they enter his chamber for the final battle but find that he’s already done for because they handily squashed his goon squad. The End. Of course, that quote comes from the villain, Animus. But even Animus is used as an example of how sacred texts can be interpreted to mean anything someone wants them to. He comes up with the whole “destroy humanity so religion can do no more harm” solution by “interpreting” the Dead Sea Scrolls to his liking. And there isn’t really a counterpoint to the anti-religious themes in the issue, either. At no point does a character stop to argue that religion has brought comfort and art to the world or whatever. Golani only triumphs through violence and show of force; that HER religion is stronger than HIS religion and she’ll pound anyone into the ground that says otherwise. In that last regard, it’s a pretty good simile of the never-ending conflict between the Israelis and the Palestinians. Personally, I’m of an Agnostic attitude; I’ll find out what happens when I die. I don’t much care for those who oppress others with their religious beliefs, but I know that those sorts of assholes aren’t the norm, either (they’re just every single politician in the United States). “The Animus War” is a strange story in that it isn’t a particularly well-crafted action narrative (Golani has no back story, Katmandu and Al-Falqa have no call to be there, the conflict is resolved as anticlimactically as possible), but it has a remarkably daring “moral” underlining it. I think the only kid’s property I’ve ever seen promote Atheism to this degree was “Dexter’s Laboratory”, where a thinly-veiled Stephen Hawking parody does a song and dance number about the superiority of science to spirituality (“Mother Nature and Father Time both ruled the world together; But if you take just a little time you can prove them wrong and do them better!”). Whether you agree with the sentiment or not, it was definitely a ballsy thing for a children’s comic to do. And speaking of ballsy maneuvers, that brings us into the Mighty Mutanimals back-up, which has finally concluded. So yeah. They’re all dead. Steve Murphy’s and Ryan Brown’s reasons for slaughtering the Mutanimals have always seemed rather petty to me. 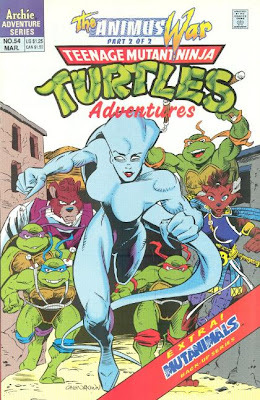 Their ongoing series got cancelled unceremoniously, and despite a lot of pitching and back and forth with the various corporate entities involved, they were unable to launch their Mutanimals cartoon series and toyline. So in the wake of that frustration, Murphy and Brown just decided to kill them all off. If they can’t have their own comic, cartoon and toyline then they’re better off dead, right? “Megadeath”, as a whole, was not a well-executed story. I get what they were trying to do, building up the Mutanimals’ secret headquarters and rogues gallery and trying to set them up as their own unique group, only to shock the audience by slaughtering them all without any warning. It definitely makes their deaths a real surprise, but at the expense of wasting all the potential they’d been crafting for so many years and so many issues. All because Murphy and Brown couldn’t get that stupid cartoon they wanted. On the bright side, “Megadeath” spins off into “Terracide”, a very heavy arc dealing with the aftermath of this stupid storyline. “Terracide” is quite good and we couldn’t have it without “Megadeath”. So I suppose it’s a case of “the ends justifying the means”. Still, “Megadeath” was just an awful mess (how can you be LATE Donatello!? YOU HAVE A TIME MACHINE!!!). ...wow, the poor Mutanimals suffered the same fate as the Lone Gunmen would a decade later. Raise your hand if you believed that the Mutanimals would "magically" be brought back to life by the conclusion of the next arc! Yeah, "shock" is the word. I just couldn't believe it happened to beloved characters like Mondo Gecko, Leatherhead, and etc. I appreciate your scolding of this plot point, Mark. It was pretty much an excuse to do the Terracide arc at the expense of deep characters who had really had lots of time invested in their history. Good analysis of this issue's anti-religious rhetoric. From what I know of Steve Murphy, he doesn't strike me as an atheist these days... maybe more of a spiritualistic/moralist/agnostic. I'm guessing he doesn't have much interest in "organized" religion. But I think your assertion that this issue subtly (or not so subtly) promotes an atheistic worldview is probably accurate. And I had no idea Dexter's Lab had an atheistic song either. I'm gonna have to look that up. This whole "Blind Sight" arc did feel pretty rushed now that you mention it. I think it might have benefited from being a 3-parter. as i stated before, they should have gotten an honorable dead, one that were at the level of their status. it was just a cheap blow. and at the previous issue no one said anything about splinters' shirt "elvis lives"... indeed. The art didn't help with showing that the Mutanimals were dead. I rather liked the sourcebook update saying that the guns the Four used were sonic blasts that vibrated the heart into exploding. But that's horrible for the Mutanimals. I'm glad the Nick TMNT had a version of them, even if the stupid Pigeon Pete is in it.